Marouane Fellaini has passed his medical ahead of joining Chinese club Shandong Luneng. The Belgian international spent over five years at Manchester United, winning an FA Cup, League Cup and Europe League. 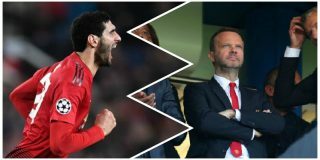 Not renowned for being technically gifted, Fellaini spent the majority of his spell at Old Trafford as a Plan B, with former manager José Mourinho getting the best out of the midfielder. Simon Stone from BBC Sport has revealed that Fellaini’s exit won’t see any new arrivals on transfer deadline day, with the possibility of signing a player ruled out once the window shuts. United run the risk of being light in numbers across midfield as a result. Caretaker manager Ole Gunnar Solskjaer will face a headache if any of his preferred three midfielders — Ander Herrera, Nemanja Matic and Paul Pogba — pick up injuries between now and the end of the season. He has Fred, Andreas Pereira and Scott McTominay to pick from if he chooses to mix it up any week. Fred needs to get a run of games under his belt to help him settle into the English game, but United need to ensure he has a future at the club if they’re to keep paying his wages beyond this season. As for Pereira, he’s not really cutting the mustard and McTominay isn’t good enough for this level. Our midfield options could be very different this time next year.